My name is Anthony Donnelly; I was born in Glasgow Scotland and immigrated to Canada when I was a child with my mother and father, frequently returning to the U.K. on holidays. I want to tell a story of the birth and creation of a culture that exploded amongst youth in North America called the, ‘rave scene’. I thought the story would be best told by one of the persons responsible. The year was 1988 and I was returning to Glasgow for a visit, but this one was much different from all the other ones that I had encountered, little did I know this time it was about to change my life completely and the rest of Toronto’s youth for that matter. This was a different U. K. from what I was used to. There was this new sound out called ‘house and techno’, there were hard nosed Britt’s now in mock rituals dancing together. This experience was all too welcoming, overwhelming, and I really took it to heart. I returned to Canada three weeks later dissatisfied with the reality that this movement did not exist in North America and then decided at that very moment someone had to get the ball rolling. That very same week I was introduced to a person named John Angus, who had also just returned from Glasgow and had encountered the exact same experience. This meeting of two complete strangers was when the pilot was lit. We had both agreed to start and try to figure out a way of getting this off the ground. The three main elements that were required to get this up and happening were ecstasy, a venue, and a DJ that was already up to speed with this music that was to come. Now the hunt was on. The only knowledge of this ecstasy I had heard of was in the gay scene at the time. It was a desperate and quick hunt through the gay bars and after-hours clubs. Within three long weeks we found the first element. During the couple of week’s travels we had caught wind that there was a DJ named Mark Oliver, playing this sound at a run down shady warehouse unit, to an empty dance floor called ‘23 Hop’. Eager to meet him and see the venue we went the following week. The moment we walked into the venue, seen it was completely empty, and heard the music the stage was now set. Manchester had the hacienda, New York had the limelight and Toronto now had 23 Hop. At the end of the night we spoke with the DJ who coincidentally was from Glasgow and shared the same views and vision. It was then that Malik X, Dr. No and Sean L were brought on board to complete the “Booming System Collective”, the musical innovators. The following week John and I brought five friends with us to the hop, and they too had the exact same experience as me. That was the planting off the seed if you will. The five guests we brought that night had spread the word with us and at week two there were now fifteen of us. This ritual followed the same pattern for several weeks on end bringing us now to a crowd of roughly one hundred people in on the event, at the ground zero of a look at things to come. The word was out. The people that were attending theses parties were molding dance culture never to be changed, they were the future. At this point John and I approached the club owner and offered him one thousand dollars for his venue on the Friday night. He was hesitant, and at first refused seeing the potential of what was going on until we reminded him that we could take them all to another venue, so he agreed and he got the bar profits and we took the door and what ever else. Within two months there were four hundred people attending ritually and it was mission accomplished. We named our production company ‘EXODUS’ and it kicked off an entire culture in North America never to be the same. The economy is in recession. Sound familiar? Now subtract 18 years. Then minus the World Wide Web – which was still years away from being a household name. Add the CD – which was now greater than vinyl as the medium for music. And don’t forget the remainder – the cassette tape – still king for music sharing. The computer had become an instrument – it made house music a constant a decade earlier. House was the root of “electronica” and “EDM,” terms which hadn’t even been formulated yet. There was another computer-generated sound in the equation – “techno” – sample-heavy like house but a much harder sound with multiplied beats. In June 1991, techno raves had been surging in the United Kingdom for a few years, but here in Toronto they were non-existent. Finding a club or other venue that embraced techno would prove to be a mission that was next to impossible. There were, however, a few British Embassies in Toronto that accepted rave refugees with open arms. 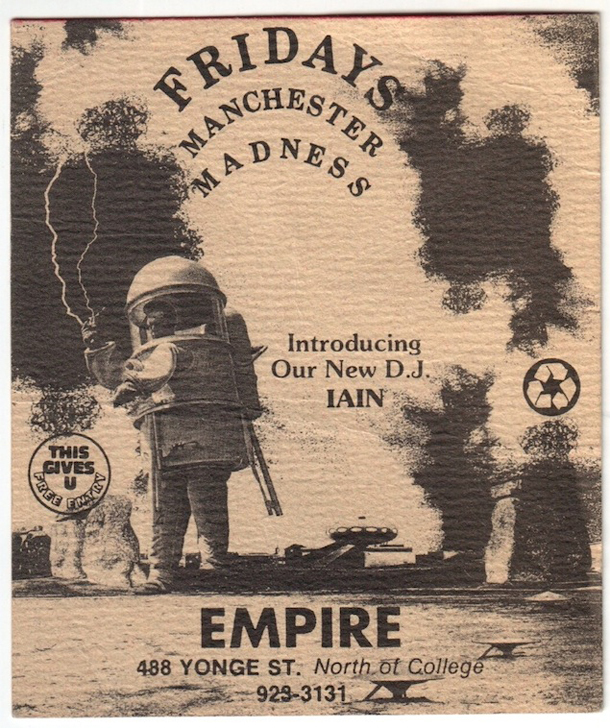 The Artful Dodger pub (still located at Yonge and Isabella) and “Manchester Fridays” at Empire DanceBar located a few blocks down the street on Yonge. Both venues facilitated the formation of score-knowing punters who were like-minded in their search for the elusive rave. The leaders of the pack were mostly of UK descent, Scottish and English, so these venues were like home; familiar settings to mind their Ps and Qs and subsequently get mental at whichever club or warehouse party they could find. The syndicate grew exponentially every weekend and was fast becoming infamous amongst the city’s warehouse and gay after-hours scenes. They would enter venues in mobs, decked out in Stussy hats, baggy Joe Bloggs jeans, Adidas Gazelles and loose-fitting tops; attire which provided the comfort necessary to dance to their own beat for hours on end. The destination was usually an after-hours event where DJs showcased underground music, but it was obvious that this crew didn’t quite fit in. They were on a mission to bring a new culture to Canada and armed themselves with Fox 40 whistles to make sure their message was received loud and clear. As a result, they were increasingly being regarded as unwelcome. A few variables were still missing in the calculation that would soon equal rave in Toronto. The flip side of this tape is a bit of a mess. We get jolted around, songs and mixes get cutoff and there’s partial duplication of side A. It’s still well worth a listen, lots of obscure techno tracks. About half way through the tape you’ll end up on the flip side of obscurity with Get Ready For This by none other than 2-Unlimited. “How dare you!” you say? Remember where we are in time right now, Get Ready For This had just been released around this date in 1991 and like most mainstream tunes they make their rounds in the underground first. Try hard not to skip forward because there’s some smooth mixing that makes the exit from this song even more enjoyable. Unfortunately who ever was mixing ran out of incoming beats and then we’re jolted around again. Soon after we’re greeted by Joey Betrum’s anthem Energy Flash. One minute it’s “ecstasy, ecstasy” and the next it’s, “total destruction!” with Annihilate by The Annihilator. What ever is left standing gets taken care of by Hurricane when Sykosis 451’s track gets mixed in.